To all who gave food, their time and other donations to make the Howard Staff Luncheon a huge success, we would like to thank you. Your generous donations were thoroughly enjoyed. The staff had a wonderful time at the luncheon and were ever-appreciative. Many of them thanked us multiple times, and asked us to pass on their appreciation to all of the Howard parents who made the luncheon possible. You may pick up your dishes and serving utensils on the table in the first floor hallway. April 12th marks the start of Terry Fox’s Marathon of Hope 37 years ago. As part of the Canada 150 celebration, we are encouraging students on April 12th to visit our website to share a few words about what Terry means to them and be entered in a random draw to win one of 150 Terry Fox t-shirts. Students can click on “What Terry Means to Me” to enter (link will be live April 12). Students may not have time during the school day so we encourage you to have them go online from home on April 12th. We thank you for joining us in the fight against cancer and continuing Terry’s legacy for generations to come. In Swahili Rafiki = Friend. Being a friend to the world means making sure everyone gets the opportunity to lead the life they want. We ARE fundraising handmade Rafiki bracelets to help Kenyan artisans earn money for themselves and their families so they can send their children to school and take charge of their future. ● Wear it your way – as a bracelet, necklace, anklet, headband, give as a gift and more! Order forms will be sent home by classroom teachers on March 30th. Orders will be accepted until Thursday April 13th. Rafikis will be delivered by the end of April. All proceeds collected after expenses will be donated to WE Education Fund. Order forms are available through classroom teachers, the office and the attached flyer. It’s Opera time again. We’re offering dress rehearsal tickets for performances at the Canadian Opera Company. Howard’s music department gets to purchase tickets for dress rehearsals on the condition that the tickets are allotted on a ratio of 1 adult to 3 children. This is so more kids get to see the performance than adults. Tickets are $20 each with $5 per ticket going to the Howard music department. Please provide the names of the students who will be attending. The students can be siblings, peers or cousins. They don’t have to be Howard students. Please send cash or a cheque payable to the “Howard Home & School Association” with your order. Tickets will not be ordered without payment. Because tickets have to be prepaid, no refunds can be given. If you cannot attend a performance you are free to give or sell your tickets to another student. If you would like tickets please fill in the order form below and have it returned to the music room by Wednesday, March 29th, no later than 3:30 pm. Tickets will be allotted on a first-come, first-served basis. If you have any questions please email Ines at icolabrese@hotmail.com Thank you! Number of tickets ___________x 20.00 = ______________cash or cheque to Howard Home & School Association. Earth Hour is an international event usually held on the last Saturday of March between 8:30-9:30pm. During this hour, people around the world turn off their lights in support of addressing climate change. At Howard, we will be participating in Earth Hour on Friday, March 24, 2017 by powering down and turning off or unplugging all non-essential lights, computers, and other electrical devices. During this hour, students will have the opportunity to participate in various activities to learn about the importance of reducing our use of electricity. Through learning and action, we can make a difference for our planet. In addition to our school Earth Hour event, we encourage students to take this message home and as a family, participate in Earth Hour on Saturday, March 25th between 8:30 and 9:30. Some activities you could do include: stargazing, board games by candlelight, or make a family pledge to commit to protecting the environment. By reducing and conserving our energy use we are helping to reduce the amount of air pollution in Ontario caused by the burning of fossil fuels to generate electricity. In fact, the air quality in Ontario has improved in recent years because of these types of actions. We look forward to hearing about all the creative ways your family participates in Earth Hour! Photos are welcome! Thanks for your support in this worldwide movement to raise awareness about climate change and protect our planet! 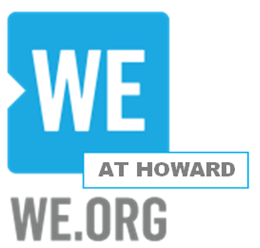 Howard Public School’s newest club is called WE Club. We focus on social justice issues on a local and global level. Our first initiative is to present a special screening of the documentary “ON OUR WAY TO SCHOOL/ SUR LE CHEMIN DE L’ECOLE” at the Revue Cinema on Thursday March 30th at 1 pm. All grade 4, 5 and 6 classrooms will be attending this event. The cost per student is $4.00; this includes the cost of the film, and a bag of popcorn each. The movie will give our grade 4, 5 and 6 students the opportunity to explore how education can serve as a tool for change, investigate the local and global barriers that prevent access to education and discover the journey children around the world take to receive an education. The documentary is in French with English subtitles. Lucy Fromyer from WE schools will speak to our students before the film about the WE organization and WE schools. This event will be a kick off of our global fundraising campaign “We Are Rafikis”. In Swahili Rafiki = Friend. Being a friend to the world means making sure everyone gets the opportunity to lead the life they want. We will be fundraising handmade Rafiki bracelets to help Kenyan artisans earn money for themselves and their families so they can send their children to school and take charge of their future. Rafiki bracelets are made by Kenyan artisans and can be purchased by the Howard Community for $10.00 each. Wear it your way – as a bracelet, necklace, anklet, headband, give as a gift and more! The Rafikis will be sold in the weeks following the film. Order forms will be sent home by classroom teachers on March 30th. Orders will be accepted until Thursday April 13th. All proceeds collected after expenses will be donated to WE Education Fund. Extra order forms will be available in the office.